Jesus of Nazareth: The Infancy Narratives was released last year (2012) on November 21. 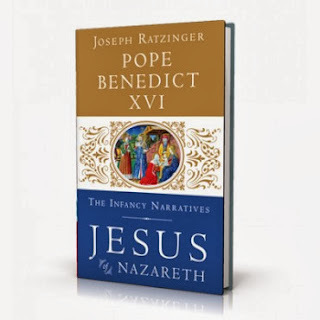 It is the third installment of Pope Emeritus Benedict XVI's series on the life and teachings of Jesus Christ. 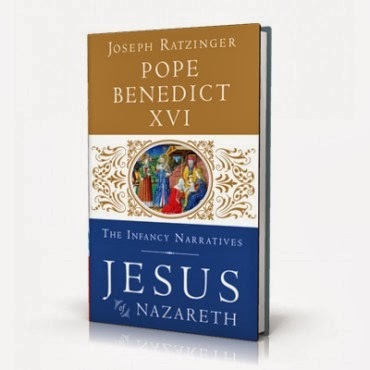 In this final volume, Pope Benedict XVI writes beautifully and in a scholarly manner the accounts of Jesus' birth and early childhood. He explains the story of the Nativity in a manner that makes sense and removes the falsehoods atheists and others try to apply to the event-mainly that it was borrowed from Pagan sources. He examines in great detail the events surrounding Christ's birth, the reason behind His birth and how the Church has understood it via Sacred Scripture and Tradition. He refutes all claims that the events of Christ's birth did not happen and that Christ is just a retelling of a previous deity. The Pope Emeritus explains the astrological aspect to the story, namely the "star," the layout of the Nativity scene and other details often misinterpreted or presented differently due to cultural adaption. Twitter troll "Rosa Rubicondior" recently wrote a fallacious blog post regarding Christmas claiming Scripture to have contradictions, etc. Had "Rosa" read Pope Benedict's book, he wouldn't have written such a ridiculous uneducated blog post for Pope Emeritus has debunked all the points "Rosa" makes and shows that there is no contradiction. I posted a comment informing him about this and naturally he did not post it. He is obviously fearful that people will find out his post is bunk. The book is a short read and shouldn't take more than a day to read. It is filled with citations and other references which makes this book a scholarly edition to any academic's library. I recommend it to all, especially Christians who want to know about Christmas. Atheists and others should read it as well so they can see that ideas claiming Christ to be Mithra, Horus or any other Pagan deity is just unfounded and not accepted by academia. Thank you Michael, for the excellent review, I wholly agree with you. I believe anyone who is serious about understanding Christianity should read this book and the others as well. I note your remarks about "rubicondior", the person is a first class idiot and bigot. His ignorance of scripture and it's history is all too apparent, and as for his postings, they're willfully disingenuous and fallacious. God have mercy on him. Thanks.